How much is Iyanla Vanzant Worth? Iyanla Vanzant Net Worth: Iyanla Vanzant is an American motivational speaker who has a net worth of $4 million dollars. 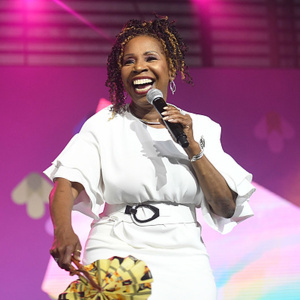 Iyanla Vanzant was born Rhonda Eva Harris in 1953 in Brooklyn, New York. She studied at Medgar Evers College and Virginia Union College. Vanzant is an ordained Yoruba priestess and New Thought minister. She is considered among the most influential black Americans. Vanzant is primarily known for her books and talk show. Her titles include "Interiors: A Black Woman's Healing – In Progress", "The Big Book of Faith", "Acts of Faith", "Yesterday, I Cried: Celebrating the Lessons of Living and Loving", "In the Meantime: Finding Yourself and the Love You Want", "Acts of Faith: Meditations for People of Color", and "Tapping the Power Within: A Path to Self-Empowerment for Women". Her first title was published in 1995, with her most recent release in 2010. Vanzant hosted her own TV series, "Iyanla", from 2001 until 2002, and later "Iyanla, Fix My Life" on the Oprah Winfrey Network. She's a frequent guest on Oprah's show, appearing more than 20 times over the course of a year. She's also appeared on "The Chris Rock Show", "Super Soul Sunday", "Katie", "Anderson Live", "Joy Behar: Say Anything! ", and "The Dr. Oz Show".